the Mountain House Team launched a new Friday Peak District Ramblers group. We try to pick routes that are suitable for people with awkward or limited mobility (avoiding high stiles or ladder stiles). On Friday 31st October we started from Tideswell Dale car park and walked a circuit via Litton Mill and Litton. Mike was very proud to receive an invite to 10 Downing Street (in his capacity as a member of the BMC Executive Committee and Mountain Leader Training), the event was a reception in ‘Celebration of British Mountaineering' and attended by. The BMC team were accompanied by a selection of some of the most respected mountaineers and climbers, including Sir Chris Bonnington, along with Sport England representatitves and Sports Ministers, Gerry Sutcliffe. 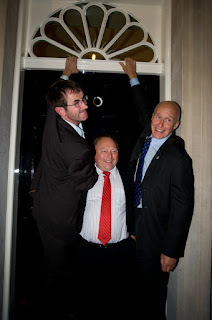 Mike is pictured here with Andy Cave and Alan Hinkes.